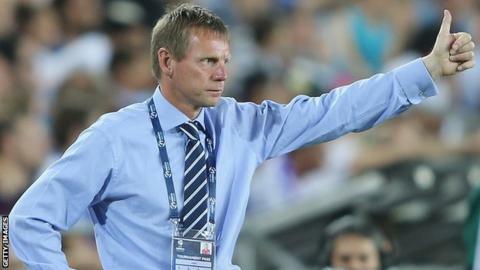 Stuart Pearce says he is "very likely" to become the new Nottingham Forest manager at the end of the season. Former Forest captain and England international Pearce had initially turned down the job for family reasons. But it appears the 51-year-old has changed his mind, confirming that talks with club owners are ongoing but had been positive. "I'm still talking with Nottingham Forest and I'm due to go up and meet them [on Thursday]," he told Talksport. Pearce spent 12 years at Forest where his trademark crunching tackles earned him the nickname "Psycho". He left in 1997 after a brief stint as caretaker player-boss. He played for Newcastle United, West Ham and Manchester City after leaving Forest and was Manchester City manager for two years from 2005, taking over as England Under-21 boss in 2007 - a job he held until June 2013. Pearce, who spent 12 years with Forest as a player, would take over in the summer after former boss Billy Davies was sacked last week. With seven games of the season remaining, Forest are seventh in the Championship, two points outside the play-off places following a 10-match winless run. Gary Brazil has been placed in charge since Davies left the City Ground after 13 months at the helm. Former left-back Pearce, who was nicknamed "Psycho" for his combative playing style, admitted that he still had a lot of affection for the club. "Forest have always been well supported whatever league they've been in, there's a rich history there," he said. Pearce joined Forest in 1985 and left after a brief spell as caretaker-manager in 1997, subsequently playing for Newcastle United, West Ham and Manchester City. After a two-year spell as Manchester City manager from 2005, he took over as England Under-21 boss in 2007, a post he held until June 2013. Pearce remains a popular figure with Forest supporters, and the club's owners are keen to appoint someone with a strong connection with the club. Neil Warnock rejected the chance to take over as manager, while other big names have been linked with the post. The club have previously confirmed their interest in former West Ham and Watford boss Gianfranco Zola, 47, ex-England manager Glenn Hoddle, 56, and former Cardiff and Watford manager Malky Mackay, 42.